About a year ago I got a call from Jeff Trueman, a gent I met when he was a student at Berklee in the late 1980s. As is commonly (and sadly) the case, we lost touch for many years. It's always great to reconnect with an old student, and especially great to see how well they've done. It's deeply gratifying to find you've played even a tiny role in helping them. Such was the case with Jeff who is now running a production company in additional to many other formidable achievements. Jeff said he was in discussions with Wave Alchemy about a music collection they wanted to create that featured traditional Afro-Latin percussion instruments and rhythms played to dance-style tracks and grooves. I've been intimately involved with Latin music and percussion most of my musical life, but I couldn't say I was intimately familiar with dance tracks. I told Jeff I was very interested but that I may not be the right guy for this because I wasn't sure I knew enough about the genre to play the right rhythms and feels. He said, "No, you don't have to do that. That's not what they want. They want you to play all the instruments and rhythms you normally play, and play them the way you normally play them. You'll just play it all over the dance grooves." He said we'd also do a standard sampling session of all the instruments, but that the focus was to create things that sounded like live playing... long phrases and variations, and solo improvisation, just over the dance grooves. So let's see: Play my stuff all day in the studio and get it released? Let me think about this... hmm, ok done thinking. Done deal! Over the next several months we discussed and figured out what we'd record and how. By the early part of this year we had it all laid out and we scheduled the recordings for May. Steve and Dan from Wave Alchemy sent some examples of what these things are about and I started messing around with playing over the tracks. It grew to be quite fun to play to them and it was easy to see the musical connection between the styles, and I'll get to this in more detail in a bit. There were some challenges with the rhythms. One was that everything had to be played at specific tempos due to the required final formats of the loops. The thing is that certain Latin styles and rhythms are traditionally played at certain tempos and this is where they lay best; so one challenge was adapting dozens of rhythms and patterns to the dance track tempos that centered around 126 bpm. In the end this was just practicing and making them groove at these tempos, and then being able to improvise around the grooves. All challenges like this are good and after a bit I felt like I was getting it. Nonetheless I felt a bit nervous. I was wondering if on the recording days I'd be able to come up with any musically meaningful stuff over the grooves; whether the guys at Wave Alchemy would like what I played (regardless of whether we thought it was cool), and more important, would they feel it's the right stuff for the DJs, composers, and producers that will ultimately use this. Finally, and also very important: would we get all the tech stuff right in the recording process, and then later in the editing and mastering? On the first recording day Jeff and I met again for the first time since around 1988. We hung out for a bit and got to work. We had talked many hours over the previous months and our planning and discussions could not have gone smoother. There's always that chance that the vibe is not going to be cool once you meet, but that was not the case here. The vibe was great. Jeff and I did everything for the sessions. We wanted to be very careful and totally in control of every detail. 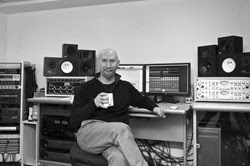 Jeff engineered and produced the session and here is where the first of the most important elements came into play. Everyone who has ever played in a studio knows that the guy producing or directing things, be it a producer, leader, contractor, whatever, can make or break the day, especially when there is a creative and/or technical challenge present. Jeff was great in juggling the ball between making sure that what had to get on tape got recorded, and making sure the flow and energy stayed totally positive with regard to the playing and the music. When you're recording and what you hear on tape makes you happy, and it makes the others there happy, you just keep playing better and the whole thing is a blast and everyone gets what they want and need. Technically we went to town with trying to capture everything in its utmost detail. I record my drums and percussion here all the time so I'm pretty familiar with how to get things sounding good, what each percussion instrument is about, and where and how you have to mic to capture all its nuance. As Jeff mentioned in his post last week, we settled on Avalon 737 tube pre's and API 3124s; the Avalons for the warmth and the APIs for the punch. This was a nice combination. In my view, instruments that traditionally were played acoustically (Latin percussion and similar percussion instruments from other cultures, jazz drums, and the like) sound nicer with this type of combination. With a nice collection of mics we got some nice sounds. 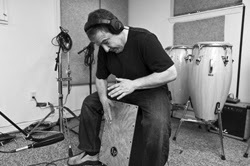 For one example, timbales have been recorded on countless records, early on with one overhead mic, and more typically over the years with two. Yes sometimes there is an extra mic or two thrown in to capture the sticking on the shells. We had a stereo pair overhead, a room mic, one mic on each shell, one direct at the cowbells and blocks, and one under each drum. We didn't know what we'd end up using, but we wanted to make sure it was all on the tracks so that in the editing Jeff had all options to bring out any detail desired. This is how the day went and we recorded hundreds of grooves, fills, licks, solos, and samples on dozens of percussion instruments. We were psyched, but this was just phase one. It all still had to be gone through and edited into its final form - no small feat considering the amount of stuff we recorded. Jeff can describe more about his work on this in a later post. 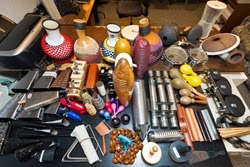 Afro-Latin percussion instruments are generally played in ensemble. Though this collection largely centers on instruments of Afro-Cuban descent, this applies to Brazilian and other Afro-Caribbean percussion, such as that of Puerto Rico and the Dominican Republic. It also applies to the African styles from which most Afro-Caribbean music emanated. Yes the instruments are sometimes played solo when someone just wants to play or "speak," on a conga for example, or in the case of a master soloist, but even here, and in most musical settings, it all works in ensemble. In a particular rhythm or style you may have ten percussion instruments, but they all come together as one, like one giant drum kit player. This is the case inside of a band or in a folkloric percussion ensemble. In essence it's the same: a collection of individual instruments and players that coalesce and sound like one big section. When you see a conga player playing a particular rhythm, say a Mozambique or Guaguanc?, on two, three, or four congas, they are adapting the parts of a given number of individual players for one player. That is, in the case of Rumba Guaguanc?, three individual drummer's parts are played by one guy. This certainly works and is done all the time, but one guy cannot play every articulation three guys would play. So when each guy plays one drum part you have a lot of subtle articulations that are very unique and interesting. Conversely, the solo player's adaptation also has unique characteristics that are different than that of three individual drummers playing. In this collection we provide both for all the rhythms. We have each individual part and adaptations with one player playing two or three parts combined. You also have all the individual samples and various loops and segments you can combine as desired. As I mentioned earlier, once I played along to these tracks for a bit certain things started to just feel like they fit. Why? Well the bottom line is that all this music comes from the same roots. Dance stuff, and various styles that have preceded it, such as hip-hop, house, various rap genres and the like, all emanated from R&B, which is a broad category that grew out of (chronologically going backwards) funk, rock, soul, blues, New Orleans second line, and so on. And what was one of the primary underlying elements of every one of these styles? The Son clave rhythm. That's right folks. You may have been playing clave all your life and not even known it. What is sometimes referred to as "the Bo-Diddley beat" or "shave and a haircut, two bits" is the Son clave. From this we also have a tumba? rhythm that is also common in funk-type grooves, which again are the roots of the dance thing. There is a lot more to this, theoretically and historically, but the point here is that all this stuff fits together in a very natural way not because we made it fit, but because it fits intrinsically. Naturally if you were playing in a very traditional setting you'd have very specific parts to play. In the Latin genre there is a joke about the "clave police," the guys that are always ready to bust your cojones if you do something that isn't right within the style. I've never been a big fan of this because it largely discourages people from learning this music and instruments. To learn something you have to make mistakes, you have to experiment, and you have to know that at some point you will be embarrassed, and you have to be willing, but once you get past this you are into some new territory, and that's what it's all about. 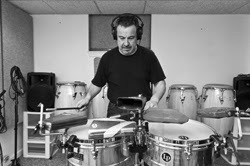 While it's true that if you are playing timbales on a salsa recording date you have very specific things to do at each point in an arrangement, and you have to do them right for the music to work, here you are the composer, arranger, and producer, and you have no limits or rules. The best example of this is that two days ago I heard some demo tracks Jeff worked up to show the instruments. I almost fell out of my chair. They sounded great, but I would have never played the stuff like this. I don't hear it like this; I don't conceive it like this. He heard it and put it together like that and it grooves and its creative and it works. Yes he played tons of instruments and loops in order to feature lots of what is on the libraries, and in an actual musical setting you likely would not put that much stuff in, but the point is that he took these traditional Latin things and turned them into various grooves with a Latin flavor and they sound nice! So go with what you hear, and mix it up. There is no right or wrong, but if you want the real Afro-Latin deal in your tracks, you have the PDF too. As I mentioned, Jeff had an extraordinary amount of material to cull through, select and then edit into the final forms. Once he was all done we turned it all over and waited for the moment of truth. We still had to get approval, and as I mentioned, we were nervous and wondering if we'd crash and burn. We liked what we did, but it had to be right for Wave Alchemy and the product and audience. When the word came from Dan and Steve that they liked everything and felt that it was technically nice in terms of recording and fidelity and that they like the music as well, we were very happy guys. I want to thank Jeff for bringing me into the project and Dan and Steve at Wave Alchemy for having us.